Steven and Darusha learned to sail in a classroom in Ross Shepherd High School in Edmonton, Alberta from a Continuing Education class that they thought would be about power boating. After a couple of afternoons on Lake Wabamun, they had attained their Basic Cruising standard through the Canadian Yachting Association and had caught the bug. 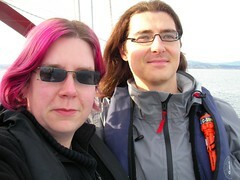 After several years of sailing vacations, Steven and Darusha moved to Victoria, BC in 2004 and bought their first boat. They sailed Wai Whare locally around the Gulf Islands and to Vancouver, and in 2006 they circumnavigated Vancouver Island. They are members of the Bluewater Cruising Association, where Steven was Education Watchkeeper for the Vancouver Island Chapter until 2008. Off the water, Steven is an Information Technology professional and Darusha is a writer and editor of fiction.